A description of the Battle of Gettysburg as seen through the eyes of nineteen-year-old Confederate lieutenant John Dooley and seventeen-year-old Union soldier Thomas Galway. Jim Murphy's nonfiction books have received numerous awards, among them two Newbery Honors, the Sibert Medal, three Orbis Pictus awards, the Margaret A. Edwards award, the James Madison Book Award, and a National Book Award nomination. Born and raised in New Jersey, Jim lives in Maplewood, NJ, with his family. "The excellent use of quotes and descriptions from Dooley and Galway’s journals brings authenticity and immediacy to the narrative. By focusing on these two ordinary soldiers, readers get a new perspective on this decisive and bloody battle. A first-rate addition to Civil War collections." 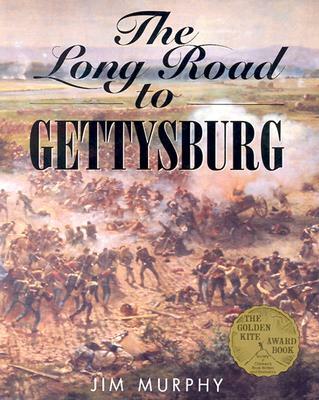 "Beginning and ending with the dedication ceremony at which Lincoln delivered the Gettysburg Address, Murphy’s intriguing book presents the story of the battle from the points of view of two actual participants. . . . The firsthand accounts, drawn from Dooley’s and Galway’s own writings, give the narrative immediacy and personalize the horrors of battle. Like Murphy’s The Boys’ War, this volume is generously illustrated with period drawings, engravings, paintings, and, especially, photographs. An important addition to the Civil War shelf."